The European Automobile Manufacturers’ Association (ACEA) shared its market expectations and some of its key policy recommendations for the year ahead at a press conference. 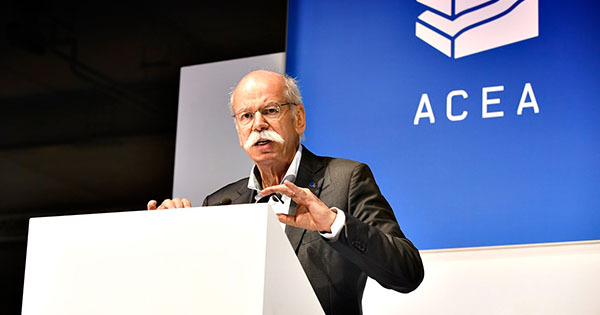 “Contrary to many newspaper headlines, and despite Brexit or the Italian referendum, consumer confidence has, so far, remained robust,” explained ACEA President Dieter Zetsche, who is in Brussels for the association’s annual reception at the evening on 8th February. Indeed, EU passenger car sales grew by 6.8% last year, bringing the total number of cars sold to 14.6 million units – the highest volume in nine years. However, uncertainty is expected to overshadow 2017, when a slowdown in EU car sales is likely with growth at around 1%, according to ACEA estimates. “Much will depend on the evolution of macro-economic conditions and political developments, but we expect our market to remain stable. Therefore, we urge the EU to continue its efforts to ensure fair access to the global market place.” 2017 also marks the entry into force of two pieces of important emissions-testing legislation: an updated laboratory test for measuring pollutant and CO2 emissions from cars (WLTP) and the first step of a new test to measure pollutant emissions under real driving conditions (RDE). “Both WLTP and RDE are essential measures to win back the trust of customers,” Zetsche stated. “But both need a proper implementation.” On RDE, the European Commission has yet to publish the fourth and last package which, amongst many things, will lay down the procedures for in-use surveillance testing of vehicles, clarify how multi-stage built vans will be tested, and address the deficiencies of the data analysis tools. Zetsche: “Regarding WLTP, a key success factor will be consumer information. And policy makers must also ensure that the shift to WLTP does not impact vehicle taxation by increasing costs for consumers.” To that end, ACEA has published a leaflet explaining the transition to WLTP, which also puts forward key policy recommendations to safeguard a smooth switch to the more accurate WLTP test.